Desktop grommet for power and charge connection. A new way to charge your devices. Ideal for individual desks, this elegant desktop grommet will power and charge your electronic devices. The SmartlockPro<sup></sup> Outlet Branch Circuit (OBC) AFCI Receptacle offers advanced technology to help protect against electrical fires resulting from arc-faults. Designed to detect a wide range of potentially hazardous arc-faults resulting from damage in branch circuit wiring as well as extensions to branches such as appliances and cord sets, the OBC AFCI responds by interrupting power. This helps reduce the likelihood of the homes electrical system being an ignition source of a fire. Often unseen, arc-faults can occur anywhere in the homes electrical system including within walls, at loose electrical connections or within electrical cords accidently damaged by impinging furniture. AFCIs are now required by the National Electrical Code<sup></sup> in many areas of the home. 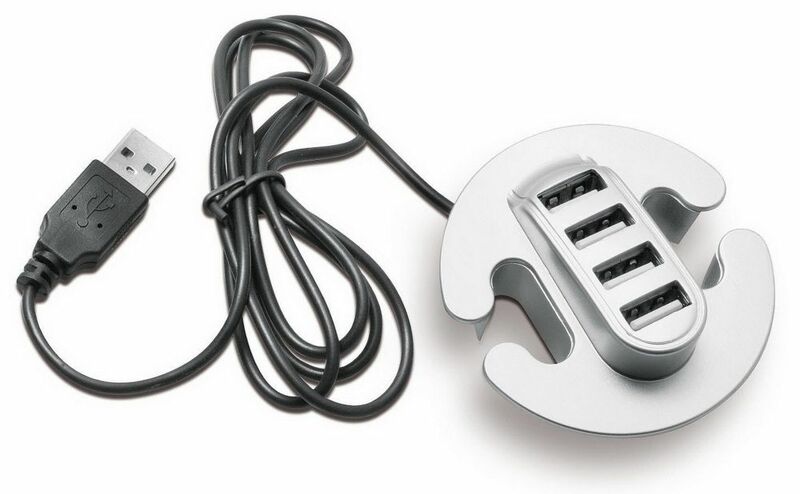 4-Port USB 2.0 Hub with Cable Desktop grommet for power and charge connection. A new way to charge your devices. Ideal for individual desks, this elegant desktop grommet will power and charge your electronic devices.